Today is 31st May,2010, the last day of the month. This day is dedicated for an 'anti smoking' campaign by the world community. Of course, it is a commendable effort by the world. Millions of members of this world is perishing because of the bad habit of smoking. It is a burning issue of the world today, no doubt. It is most important to cease the habit of smoking. It can be achieved by deciding only by the members of smoking community. Few years back, I had been a smoker. I used to smoke many packets of cigarets daily. Since the last three years I stopped smoking. Now I am not thinking about cigarets. Realize about the dangerous aspects of smoking and decide to stop it to save ourselves and our beloved community. Long live the health of the World. "The Three Musketeers" is a 19th century novel by Alexandre Dumas. But I am discussing here about three villainous HYIP sites which steal the money of many people including me. The sites are ' genius Funds' , ' verifield.com' and ' HYIFunds'. Among these sites HYIFunds still active on the internet to collect new deposits and continuing the cheating business. I have wrote about this site in my blog to promote it. Now I remind the public not to join these sites to avoid your financial loses. I hereby deleting such posts from my blog also. I lost $18.50 from 'genius Funds', $5 from 'verifield' and $8.50 from HYIFunds. My First Pay out from Upbux. Received my first payout from upbux.com. It is a very good 'gentleman' site. The overall performance of the site attracted my attention at an early stage of my joining the site. So I worked with this site quietly. On reaching the payout limit of $2, I continued to click. Today I thought to see how nicely it perform the payout instantly. I enjoyed that easiness of instant payment.Just see the payment proof. I have received my second payout from Trekpay. It is very much interesting. The amount paid to my paypal account is $10.20. Out of this amount $5 was awarded me as a Christmas bonus. On the occasion of Christmas/New Year, when I got this gift, really I got excited and praised the Great Trekpay program, it's admin and staff. As I am very much impressed with this earning site, I place it's link for the benefit of other people also. Further to the Christmas bonus to me, my friend was also awarded with $3 as New Year Bonus Gift in line with my suggestion. It is so interesting about an online earning site. Isn't so? Paypal/Facebook Christmas/NewYear gift bonanza "WishList" has ended on 31-12-2009. Now that application is not applicable. People those who participated have already receiving cash payment from paypal. Myself received $9, as my participation gift payment and enrolling referrals, to my paypal account yesterday.Thanks to the paypal/Facebook program as well as those friends joined me as my referrals. 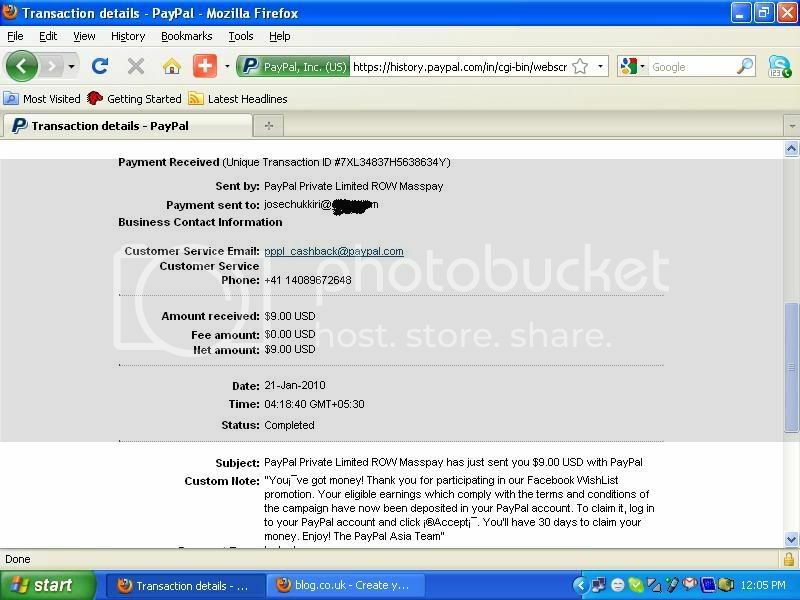 Click HERE to See the payout proof. 2010, the new year was born. I hereby wish a prosperous new year to all the visitors, friends and well wishers.